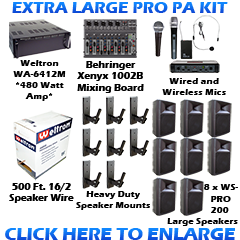 We sell PA public address sound / speaker systems for sports arenas, baseball fields / ball parks, football stadiums, soccer fields, horse arena rings / riding rinks, race tracks, mud bogs, church and school auditoriums, putt putt golf courses, landscaping areas, shooting ranges, skating / ice rinks, and more. 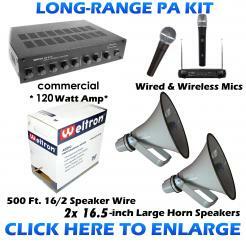 Our PA kits are ready to install - we make the hard choices for you! 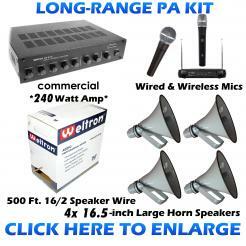 Each kit includes the necessary loud speakers, amps, mixers, microphones, and cables / wires! If you have special needs or want to place an order, don't hesitate to give us a call! Outdoor PA Sound System for budget venues: little league baseball park fields, golf courses, swimming pools, and other outdoor applications that call for music and announcements. 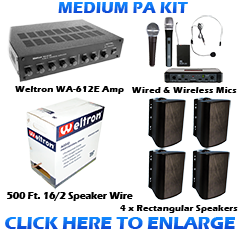 Quality sound for a great price. Outdoor PA Sound System for smaller venues: little league baseball park fields, golf courses, swimming pools, and other outdoor applications that call for music and announcements. Quality sound for a great price. Outdoor PA Sound System for midsized venues: baseball fields, horse arenas, ski rinks, and other outdoor applications that call for music and announcements. 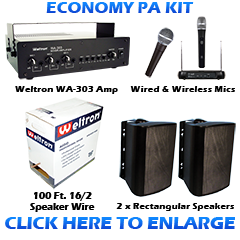 Quality sound for a great price. For those that need voice announcements over longer distance on a budget! 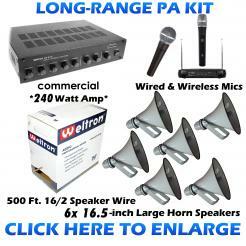 This PA System emits superb high volume public address voice audio. Outdoor PA Sound System for larger venues: sports fields, indoor/outdoor swimming pools, horse arenas, and other outdoor applications that call for music and announcements. 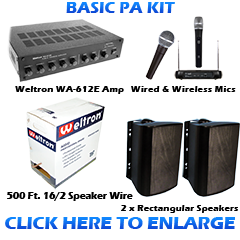 Quality sound for a great price. 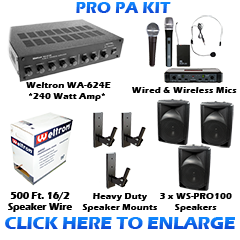 Outdoor PA Sound System for midsized to larger venues: football and sports fields, race track paddock areas, motocross tracks, horse arenas, and other outdoor applications that call for music and announcements. Quality, high-volume sound in a 3-speaker system. 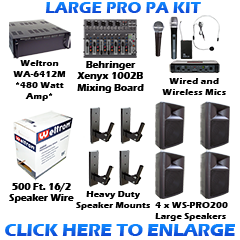 Outdoor PA Sound System for even larger venues: football stadiums, race tracks, large sports fields, horse arenas, ski rinks, and other outdoor applications that call for music and announcements. Quality sound for a great price. Outdoor PA Sound System for extra large venues: high-capacity football stadiums, large sports fields, horse arena, race tracks, and other outdoor applications that demand music and announcements. 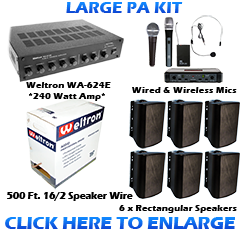 Quality sound for a great price.